This calculator will give you the price for one piece of custom cut natural latex. If you desire multiple cuts, such as three cushions for a couch, enter the combined dimensions, even if you want further cuts. Your total cuts cannot be larger than a king size mattress: 76″ x 80″ x 6″. Also, if you have an odd shape such as a crescent or a L shape, your price will be calculated by the smallest rectangle that your cut will fit into. There are no differences in price between firmnesses. Prices are calculated based on 3″ or 6″ depths. Our Arpico and Latex Green GOLS latex comes in 6” slabs and as large as 76” x 80.” We can cut in increments of .5 inch, generally. The depth and the width of a cut can be no less than 1″. In other words, we can cut a piece 33.5″ x 1″ x 6″ but we cannot cut a piece 33.5″ x .5″ x 6″. If you need to make a pattern, I recommend using Builder’s Paper or a strong paper and taping both sides of the paper when you need to tape. The better the pattern, the less we have to charge for cutting fees. Latex is rather springy and is difficult from which to get an exact cut (to the ¼”, that is). A clear pattern alleviates one potential difficulty. 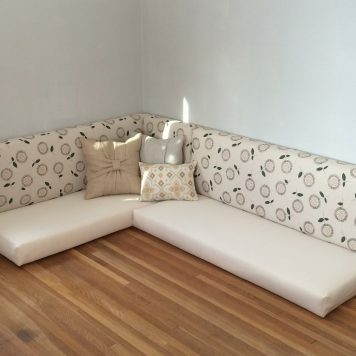 If you have general questions about futons and couch cushions, peruse this blog post and then contact us with further questions. 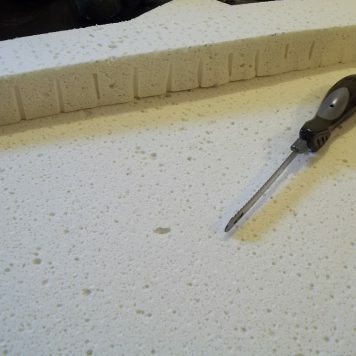 If you are looking for a mattress sized piece of latex to cut yourself that is 3″, look in our latex section. If you are looking for an uncommon depth, such as 3 1/2″, 2″, 1″, etc. check out the latex in the Clearance section. We post our special occasion depths there. Instructions on cutting your own latex are in our blog. Organic Latex likes mediocrity. On its own, it dries out in direct sun light or direct heat (such as a from an air vent). It prefers to be dry. However, it requires no care and if soiled is fairly forgiving. Were you to remove the wool and ticking, you may spot clean the latex with a damp cloth or vinegar. Soak up as much moisture as possible with a towel before allowing it to dry in shaded room. Avoid strong cleaning solutions, as they will degrade the latex. The latex also absorbs odors. 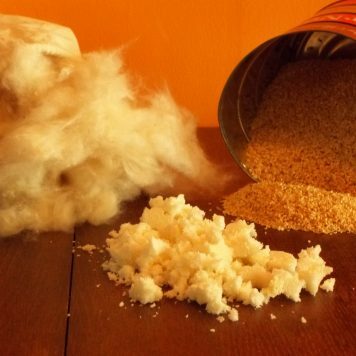 Wool is an effective barrier from body odors, but if you have pet accident or unusual amounts of smoke in the room, you may deodorize the latex with vinegar. Fill a spray bottle with white vinegar and mist the affected area. Let it air dry for 24 hours. Repeat if necessary. If stained, hydrogen peroxide will eventually reduce the discoloration. However, it also may be too strong for the latex and degrade it. You can find out. Latex is quite good at collecting dust and hair. If you want to keep it clean, keep it covered. If you feel it needs vacuuming, you can vacuum through the ticking. If you remove the ticking to vacuum, use a wand attachment and be gentle. Keep in mind, the latex is anti-microbial, which means that latex is reluctant to grow mold or mildew. If the latex were to get soaked, soak up the water as quickly as possible. Just like a sponge, latex is absorbent and will retain the water that you do not remove, though it will air dry eventually. Do NOT submerge your latex in water. You will notice as you try to pull your latex out of its bath that it will fall apart in your hands. 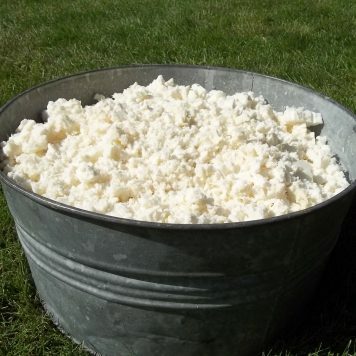 While latex is the most breathable of all bedding foams, it does appreciate the chance to let wetness like humid air and body moisture evaporate. It does well on a slatted frame in a climate controlled environment. It can do perfectly well in small spaces such as tiny homes and RV’s as long as their ventilation system is kept running to remove the condensation. Those of you who have non-air conditioned homes or who put the latex on a solid board instead of slats may find that once a month, you will want to give the latex chance to breathe by flipping one side of the mattress up one day and the next day flip the other side up.